The Guardian reports today that Michael Gove, the education secretary, has said that that the inclusion of the question, "Explain, briefly, why some people are prejudiced against Jews" in a Religious Studies GCSE paper was "bizarre". Gove adds "To suggest that antisemitism can ever be explained, rather than condemned, is insensitive and frankly bizarre. AQA needs to explain how and why this question was included in an exam paper." 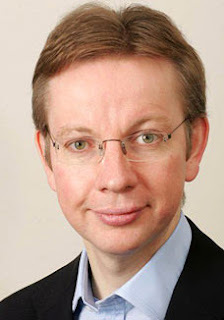 Personally, I find Gove's reaction bizarre. I believe all children should gain some understanding of how such prejudices arise. Surely, that's one of the best defences against such prejudices. If you don't know why they arise, you are much more likely to be vulnerable. In this case, it seems to me, it is particularly important that we understand how this violent prejudice arose. Many millions of people were killed as a result of it. And it's still around. Suppressing such questions for fear of being "insensitive" and causing offence seems to me, in this context, to be absurd (in fact, isn't this the sort of "political correctness gone mad" that right-wing hacks love attacking?). Many Jewish websites offer explanations. And of course, most of us are aware what the explanations are. So why can't we discuss them openly with young people? Perhaps part of the problem here is that Gove is, remember, a journalist by trade, and it is in the blood of hacks of his reactionary stripe to insist that anyone who offers e.g. an explanation of rioting, criminal behaviour, etc. in terms of social, psychological, or other factors is just "excusing" it. It seems Gove doesn't understand the difference between explaining and excusing. Hence, on Gove's view, the AQA exam board were in effect inviting children to excuse antisemitism when they should have been condemning it. Here's another illustration of the distinction between explaining and excusing: by explaining Gove's silly comment, I am not excusing it. There is ignoble precedent. John Major: "we need to condemn a little more and understand a little less". Gove's reaction was kneejerk: he did not actually put the question in context. In part, he may have been suffering under his own prejudices, or else thinking, sub-or-unconsciously, that people don't remain prejudiced; a sort of "didn't we sort all that out after the war?" mentality, which is, of course ignorant and naive. He is protesting more for the sake of protesting and, as you say, it is political correctness gone mad. The reasoning of it, I think, might be that students, when answering this question, will suddenly think, "oh my! YES! People ARE prejudiced against the Jews! I LIKE THE SOUND OF THAT," and become prejudiced themselves, and for Gove, cause another holocaust. We know the holocaust was bad, so we don't want that again. This obviously would never be the case, but silly Gove is so shocked and has so much emotion invested in his reaction that he's unlikely to be seeing clearly. But as you say, he is a journalist. Unfortunately it seems, not a very good one. I am loathe to agre with Gove, but sadly I find myself agrreing with his comment that this is 'bizarre', though I would like to believe my response is less reactionary and much more measured. The key issue here is that the exam question seems to treat anti-Semitism as a controversial issue, which it isn't - anti-semitic behaviour is uncontroversially unacceptable. "In this topic, candidates should show understanding of Jewish views on prejudice and discrimination, women, and suffering. - suffering – Jewish attitudes, the Holocaust"
All of which leads me to the conclusion that this was a terribly worded question and not in keeping with the specification. The specification would seem more likely to lead to questions like "Explain Jewish attitudes to prejudice and discrimination". I think there is obviously a place for exploring pre-Holocaust anti-Semitism in a GCSE History paper because that is part of the historical process. Taking Holocaust education seriously means being able to place facts in context. However, even in another GCSE such as RS or Citizenship, the issue here is that it gives the impression that anti-Semitism is a controversial issue - i.e. a subject the both sides of which ought to be discussed in class in a balanced manner. Personally, I favour a political criterion of what constitutes a controversial issue – so the values of the society as a whole to determine whether a debate is of a sort to count as controversial. Michael Hand at IoE has written a great deal about this (though Hand prefers a different criterion). The values of our liberal, democratic state have no time for anti-Semitic behaviour or attitudes, so anti-semitism ought not to be taught in an even-handed manner. I think it's helpful to distinguish between teaching in a manner whereby the teacher remains neutral on a matter under debate; and teaching in a manner whereby the teacher persuades his or her class to adopt a particular moral position. When it comes to anti-Semitism, along with racism, bullying and a whole host of other topics, we want our teachers to follow the latter route – it’s not a controversial issue and doesn’t warrant the same treatment as a topic like “should rich people pay more taxes?”. It is conceivable that a teacher may want to explore why people are prejudiced against Jews to give broader context, but we wouldn't want teachers in our society teaching in a manner that gives anti-Semitism a potent voice in the classroom. So, the question is indeed bizarre. It doesn't seem to fit with the specification against which the students were being assessed and it seems to treat anti-semitism as a controversial issue. I whole-heartedly agree that students do need to understand causes of anti-Semitism in the contextual background behind the Holocaust. However, that is not relevant for this particular GCSE exam and the question would need to be much better drafted. It seems to me that if the overall values of society are the sole determining demarcation between what is and isn't controversial, then the inevitable result is that the God question in most all societies will be uncontroversially settled in favour of existence. Surely some additional criteria are in order? It's often (conveniently) overlooked that Martin Luther, the godfather of the Protestant Reformation and a German, was rabidly antisemitic. He wrote a book called "On the Jews and Their Lies" in which he advocated the isolation, marginalization, enslavement and in some circumstances execution of Jews. Antisemitism has a long, complicated history deeply interwoven with Christianity. It's foolish not only to dismiss inquiry into how this prejudice arose, but into the sociocultural norms that allow it to persist even in its now marginalized status. I think Stephen raises a good point with the attitude or belief that this was some sort of aberration that could never happen again, when, in fact, it happens all the time. The question could be re-phrased: why are certain groups demonised? In modern-day Palestine you have this happening on both sides. As Mike D. points out anti-semitism has a long history in Europe, but the sociological factors are universal. Miss Badger thinks the question is too 'neutral' but neutrality is a good place to start a discussion. Obviously, Gove, and perhaps Miss Badger, think that the question invites anti-semitism, but that requires a specific interpretation on the part of the reader. Gove and Miss Badger want to play it safe, but I really don't see why an exam question should be 'safe'. It is expected that anti-semitism is going to be a sensitive issue. The question already refers to 'prejudice', so it starts out with a position that anti-semitism is biased. The more important issue would seem to be what is actually taught in the course. The question would presumably be addressing the course content. It's curious how anti-semitism works. For example, young-earth creationist Johnathan Sarfati who is himself a jewish convert to xianity has himself indulged in some dodgy name-calling. Look at the Jonathan Sarfati 21.6.07 / 9pm entry. That's where he calls Rabbi Foxman of the ADL a "secular misochristic Jew" because Foxman says that the "Expelled" movie is baloney in trying to blame anti-semitism on "darwinism". Thing is, once one figures out what "misochristic" means, the irony becomes unberable. Misogynist means basically: "woman-hating". So therefore, "misochristic" means "christ-hating". Isn't that the kind of slur that Sarfati's adopted religion has been throwing at his own people for century after century before Darwin even came along? Anti-Semitism: Prejudice against those with a particular belief system. But why precisely? Doesn’t a label need to be narrowed down, in order to exactly define what in particular that partiality relates to? With the objectionable aspect quantified it might be possible to address it. Keeping it general, means its applied to those who may be guilty of it, and those who may be innocent of it. The last refuge of a scoundrel is often seeking a flag to wrap themselves in. But thereby revealing them anti-semantic. Seriously, what on earth is wrong with this man!? Why does he even appear to assume an incompatibility between understanding something and condemning it? This government doesn't have a clue, and worse it doesn't even have a clue that it doesn't have a clue, and won't listen to those who can point this out. Basically, I agree with MissBadger on the exam question's terrible wording. However, I totally disagree on the task of teachers for shaping the pupils' moral setup. The same tool has been applied successfully in many dictatorships the world has seen, with effects detrimental. Teaching what and how to think or declaring "issues" (not just this one) "incontroversible" is not leaving any room for scepticism which is vital to reflection. The disputed exam question is part of establishing such dogma. By answering it 'correctly' the examinee would, hypothetically and disregarding the class it is referring to, have to acknowledge that "anti-semitism is a prejudice" i.e. unsubstantiated and questioning this were forbidden. Maybe it is this what Mr Gove, like I, find 'bizarre' about the question and would much rather see teaching staff, in class or in exam, provide facts and let history speak for itself to help students form an opinion instead of directly suggesting it. After all, there is still plenty of room for manipulation that way. And @ Mark D, for the sake of scepticism: Martin Luther endorsed anti-semitism, it is very old. Couldn't it be more than a mere prejudice? Usually, things which persist have something to it - usually that is, not absolutely.